So what does a Branch Board do in Meetings? Strategic Planning? The DSA SA Branch has for a long time been working towards building the groundwork for a successful state, and overall growth in DanceSport locally. On many occasions we have engaged with local members to look at how we might improve the grassroots locally. With that in mind our Branch board embarked on developing a Strategic Plan with assistance from the Department of Recreation and Sport SA. Working with Hans van Bavel, who facilitated our workshop in April 2017, we invited our SA DSA members and were pleased to have 22 members present at the half day workshop. We secured representation from the Adult and Masters [1, 2, 3] categories to work collaboratively and develop a new direction for SA. It was refreshing to have long-time members and young faces contributing towards the betterment of DanceSport in SA. We worked with our National Strategic Plan as a base point and applied local thinking to help drive our new directions and work towards change and growth. Working as a group we identified partners and stakeholders, values, core activities, pillars for action, strategies and outcomes. The following gives insight into our new thinking in SA. An active sport that encourages participation by all ages in a social or competitive pastime that brings people together in a social setting, studio environment, competition scene, or administrative endeavours. Competitors, volunteers, coaches, adjudicators, sponsors, affiliated associations and studio proprietors are all brought together to build and create opportunities for people from all walks of life to fulfil their desire to be a part of a glamorous and exciting leisure activity or participate in the demands of a competitive sport. Our values represent our desired culture - on and off the dancefloor. Inclusiveness and equality: Equality, Diversity and Inclusion – Accepting all participants regardless of age, race, gender, or sexuality. Safe environment: Children and young people have a right to be safe and protected at all times, including when accessing services in the DanceSport community. Discipline: Behave appropriately at all times and focus on your goals for success. Similar content was developed for each of our Pillars and will drive the work of Branch board members assigned to each pillar, help them to provide leadership in SA and also provide a purpose for their work on the Branch board of DSSA. The final piece of the Strategic Plan, is to develop an Operational Plan for the SA Branch Board. This work is in-draft-form and is to be developed so accountability is built into the actions and work of the Branch Board in SA. A sample of this is below. Responsibility - Who will lead? 3. Promote pathways for studios and their students/clients to engage with competitions. When all these pieces of our Strategic plan are in place, SA will be able to work cohesively with assigned leadership to Branch Board members with transparency, accountability and direction. 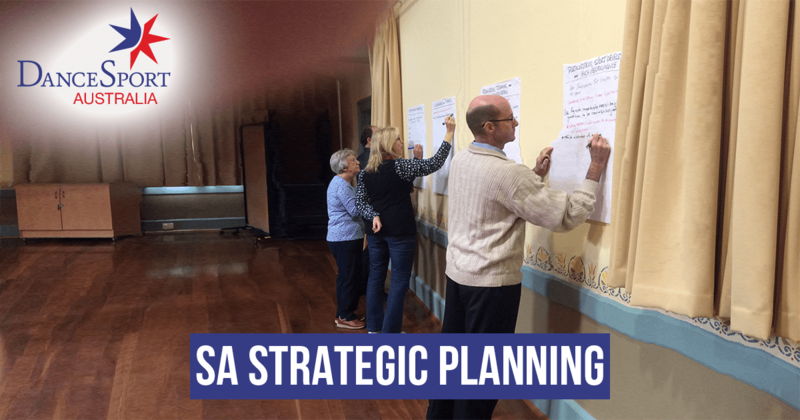 This will in turn assist our planning for the future and gain acceptance from members, the broader community and the Department for Recreation and Sport SA. Oryst Tkacz, for and on behalf of DanceSport SA.